Michael Thompson hits his tee shot on the 14th hole during Round Two of the AT&T Byron Nelson at the TPC Four Seasons Resort Las Colinas on May 29, 2015 in Irving, Texas. (May 28, 2015 - Source: Tom Pennington/Getty Images North America) - Note the discoloration of the water drenched fairway being used as a tee box. 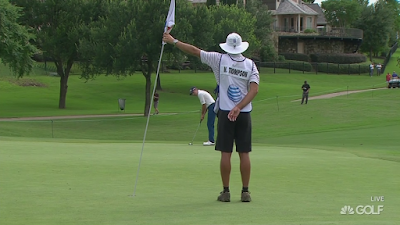 Another four and half inches of rain overnight in Dallas has some interesting side effects at the AT&T Byron Nelson today. 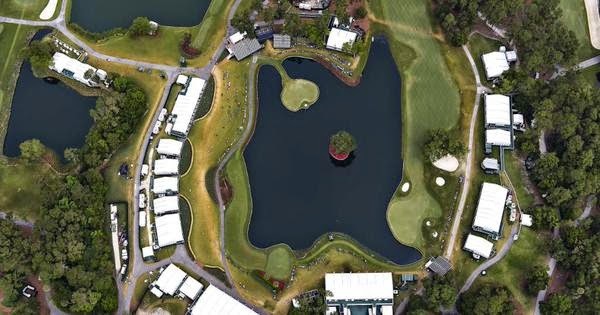 The course required a three hour delay to help it dry out a bit and then the PGA Tour determined that the fairway on the par four 14th hole was unplayable. They decided to put a tee box at the end of the fairway and converted the par four hole into a 105 yard par 3. The result was that par changed from 70 to 69 between rounds one and two. This had the weird side effect of breaking the tour's ShotLink system which affected their scoreboard, Shot Tracker, and their new fantasy golf game based on the ShotLink data. More rain is forecast for tomorrow. Round two still needs to be completed before the cut is made and groupings are set. Caddie Matt Hughes mans the flag on hole 4 as Michael Thompson attempts a birdie putt during round two of the AT&T Byron Nelson. Despite the weird goings on, Michael Thompson successfully navigated the water logged course and finished the day with a three under par 66. 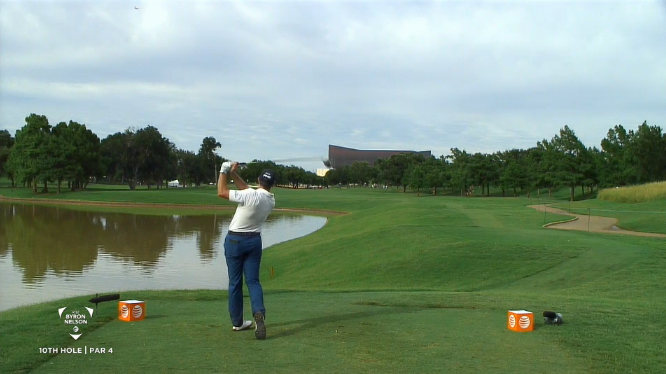 For most of the day, Michael Thompson was treading water at the AT&T Byron Nelson. He had an early birdie on the par three fifth hole but he followed with a bogey on the sixth hole. He then made pars at the next six holes. After twelve holes, Michael was sitting at even par for the round but was losing ground to the field since scoring was so good. But that's when his round got going. He birdied the par three thirteenth hole and then eagled the par five sixteenth. 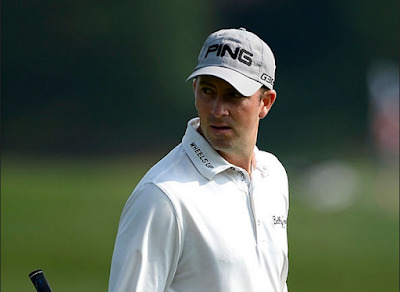 He finished the round at three under par which has him currently tied for 18th at five under par for the tournament. 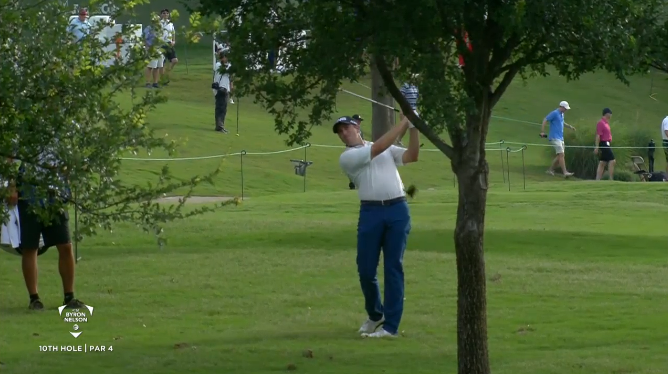 Michael Thompson takes his second shot on hole #10 during the second round of the AT&T Byron Nelson. Michael Thompson tees off on hole #10 during the second round of the AT&T Byron Nelson. For the second straight week, Michael Thompson and the PGA Tour will be trying to get 72 holes in by Sunday while dodging Texas rain drops. 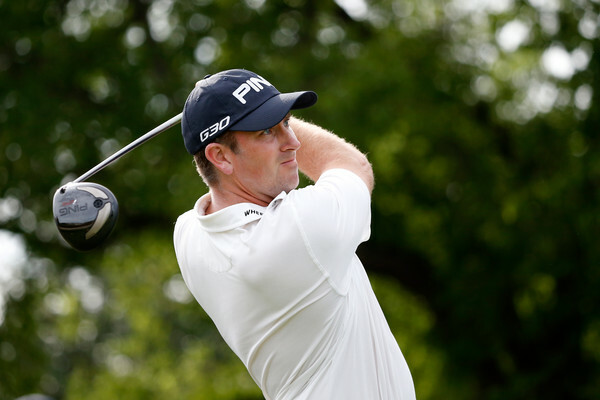 The AT&T Byron Nelson will be held at the TPC Four Season Resort in Irving, Texas. The area is experiencing record rain totals for May and the forecast calls for showers throughout the tournament. 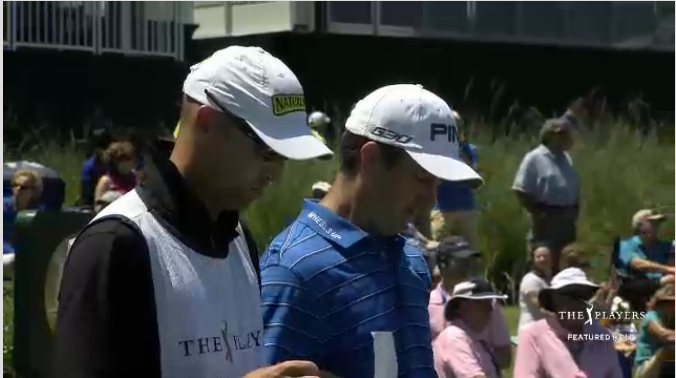 Michael will be playing with Jason Dufner and Ryan Palmer. They are scheduled to tee off at 7:40am CT.
Michael Thompson has teed off at the Crowne Plaza Invitational at Colonial Country Club in Forth Worth, Texas. He's grouped with Brian Harmon and Steven Bowditch. Michael Thompson's second round at the Wells Fargo Championship wasn't spectacular but it was good enough to keep him near the top of the leaderboard. Michael shot a one under par 71 and is currently six under par after 36 holes which has him tied for 8th. For the second straight day Michael was solid from tee to green but, as of yet, his normally reliable putter hasn't caught fire. He'll look to heat it up in tomorrow's third round. Michael will play round three with Geoff Ogilvy who was in his group for the first two rounds. They tee off at 1:00pm ET. 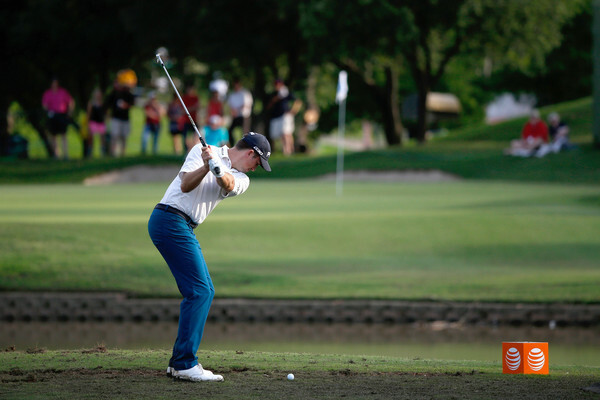 From the tee to green, Michael Thompson was superb during Thursday's first round of the Wells Fargo Championship at Quail Hollow where he finished five under par and is currently tied for 4th. In fact, Michael ranked first in the strokes gained tee to green stat at +4.674 for the day. He had six tee shots that were longer than 300 yards in the fairway. He tees off tomorrow's second round at 7:30am ET with playing partners Geoff Ogilvy and Ken Duke. In the opening round of the 2015 Wells Fargo Championship, Michael Thompson sticks his 129-yard approach to 9 feet then rolls in the putt for birdie on the par-4 11th hole. 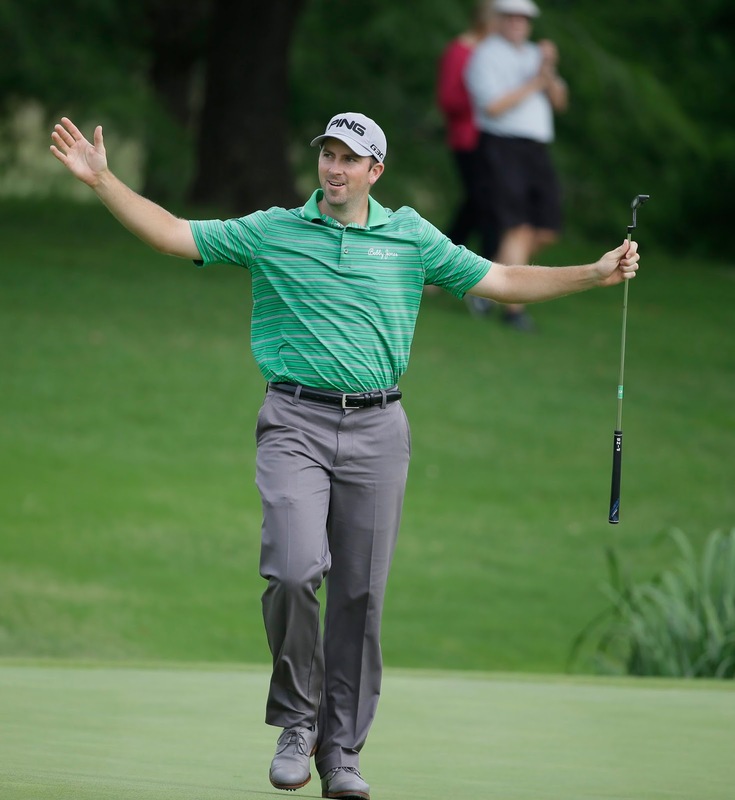 In the opening round of the 2015 Wells Fargo Championship, Michael Thompson’s 26-foot putt finds the right edge of the cup for birdie on the par-4 16th hole. In the opening round of the 2015 Wells Fargo Championship, Michael Thompson’s tee shot lands to within 9 feet then rolls in the putt for birdie on the 175-yard, par-3 17th hole. Michael Thompson will be teeing it up tomorrow at the PGA Tour's unofficial 5th major - the PLAYERS championship. 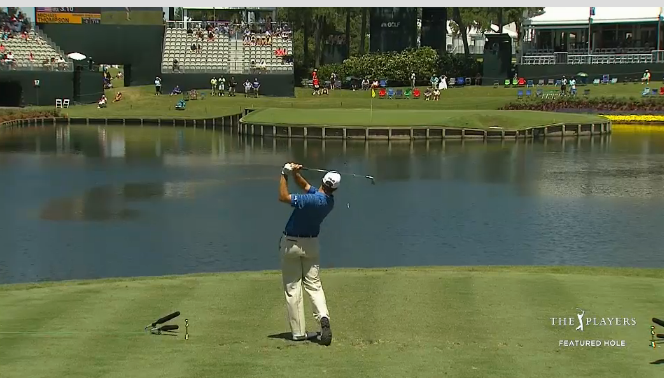 The PLAYERS is held at TPC Sawgrass which has water hazards aplenty. The most famous of which surrounds the island green on the par 3 17th hole. 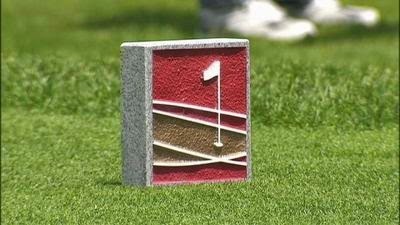 PGATOUR.com will be streaming coverage from the 17th hole for the first two rounds (see the link below). 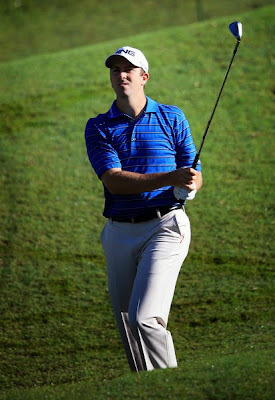 Michael tees off Thursday morning at 7:57am ET with Webb Simpson and Nick Taylor.